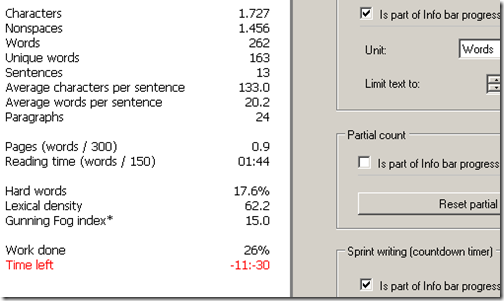 If you do any amount of writing, you are probably used to software like Word, etc. The downside with the modern tools are that they are ripe for distraction with all the bells and whistles. Every version adds more features and more options to deal with. Distraction free writing software are popular with professional writers. But, even folks who write occasionally stand to benefit from it. WriteMonkey is one such free and powerful distraction free writing software. I have been using Windows Live Writer for my blogging on various sites. But, I have decided to give WriteMonkey a try to see if it helps with my writing. There are a few reasons behind this. Even though the screen of this tool looks barebones, it is ripe with features and is hidden in a way that it doesn’t interfere with your writing. Small, fast, stable and portable. No installation needed. 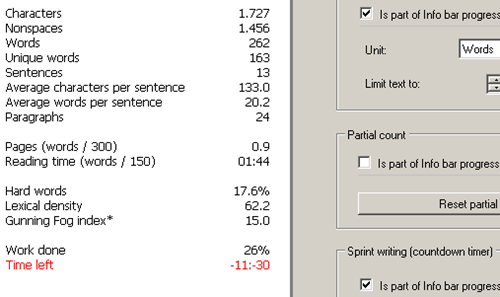 Advanced statistics – words, characters, paragraphs, unique words, sentences, word frequencies, lexical density, Gunning Fig index, approximate reading time, etc. Bookmarks and repository to store notes, drafts, etc. Inline comments just like your programming comments. WriteMonkey is a fantastic tool for writers and I am hoping to get some distraction free writing. Plus, it has all the features I am used to with Windows Live Writer – except image handling. If you are a writer or have been experimenting with your writing, give WriteMonkey a try. very interesting post! i liked it very much! thanks for sharing your thoughts and for your efforts! information. Thanks for sharing this. nice information. Thanks for sharing this with us. beneficial information. Thanks for informing.